Our very own Sachin Tendulkar is one such personality who saw his dreams falling apart.There are few things Lionel Messi should have learned from Lionel Messi. At the age of 29, Messi has decided to hang up his boots and retire from international football. Messi decided to call it in after Argentina suffered 4-2 (Penalties) defeat at the hands of Chile in finals of Copa América Centenario. After losing his third final in a major international tournament, he spoke to the media about his decisions and laid it all out that his days of chasing after the cup are over. Our very own Sachin Tendulkar is one such personality who saw his dreams falling apart. Every time he got closer to winning the holy grail of cricket - World Cup, something or the other kept him away from his dream. Looking at Messi’s decision and Sachin’s glittering career, we think that there are few things this Argentine superstar can learn from India’s cricketing legend. Sachin and Messi both faced defeats. Messi has so far lost 4 major international tournaments and Sachin lost 5 World Cups in his career but he never strayed away from pursuing his life’s ultimate goal. Sachin had the self believe and the will to carry on, and even after failing 5 times, he finally realized his dream in 2011. Sachin’s career was riddled with numerous injuries that he suffered along the course of 20 years. Sachin suffered from back injuries, a career threatening tennis elbow, toe injury and what not. He even had to go through surgeries many times. Sachin endured it all, made changes in his game and still played on because he knew what his life goal was. Maybe Messi could have taken a page out of Sachin’s book and continued his pursuit of winning an international Cup for Argentina in Russia 2018. 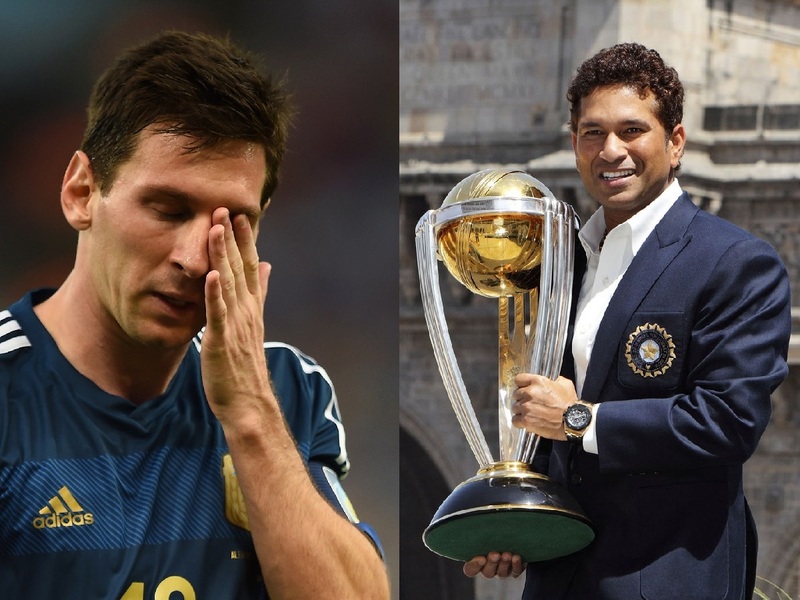 Being a captain never really bode well for Sachin, same could be said for Messi. Sachin saw it happen to him and understood that the pressure was far greater than he had expected. He choose to step down as a captain but continued to play for the country. Maybe, Messi could also have done the same and focused more on improving his own game than retiring altogether from international football. Sachin contemplated retirement after the side suffered bad defeat at the hands of Bangladesh in 2007 World Cup. He shared his thoughts with his older brother Ajit Tendulkar, who motivated him to give it another shot and try for 2011’s World Cup. Sachin always had the support of his people in victory or defeat. Messi never had this kind of unconditional support from his countrymen. Maybe, this was because he shifted to Barcelona at the age of 13 that distanced him with the fans of his nation. Maybe, it was the reason that fans and legends saw him more of a FC Barcelona player than an Argentine National. Maybe, he would not have taken this decision if he had a close confidante like Sachin had in Ajit. Messi shouldn't have taken this decision. Maybe, he should have retired from the club football for a while, knuckled down and continued to pursue his lifelong dream of winning the trophies for the his country. Sachin too stepped down, although it was from the T-20 cricket. He knew it in his heart that winning ODI World Cup was his ultimate goal and he was ready to sacrifice his T-20 career to realize this dream.